You will be given a reference e-book to read which has 286 pages And the test will be based on that e-book , you can take final test within 1 year of purchase. What is Matrix Laboratory (MATLAB)? A lot of experts also define MATLAB as a reliable programming environment which is primarily designed for the development of algorithms, analyzing and visualizing data and computing numerical information. In comparison to conventional programming languages, MATLAB is more beneficial because of its ability to resolve problems in technical computing in a speedy manner. MATLAB is also an essential tool which allows you to do some numerical computations using vectors and matrices. You can also expect it to work effectively in graphically displaying information. MATLAB is popular for its wide range of uses so enrolling in the MATLAB certification program offered by Brainmeasures can do you a lot of good. 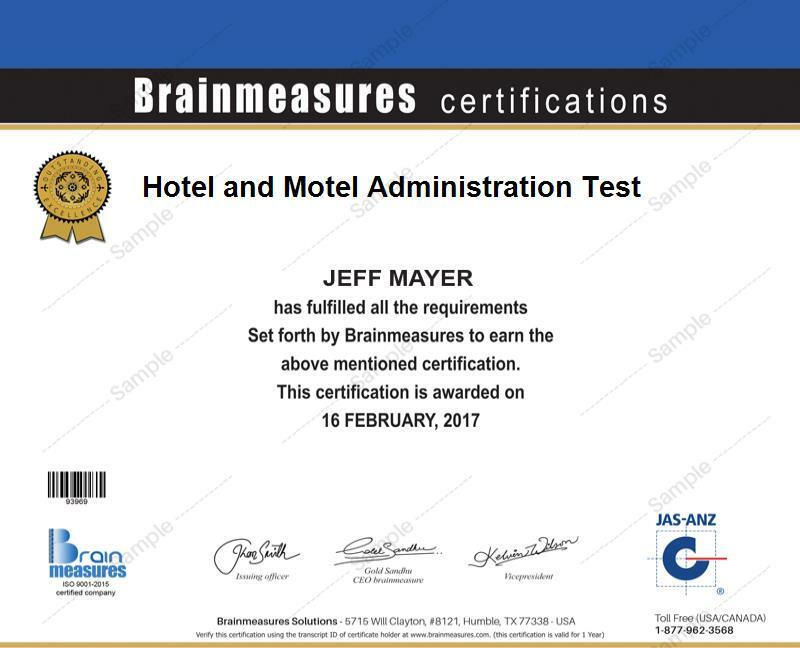 Brainmeasures has been in the industry for quite some time now and up to the present, it continues to satisfy all the participants of its online certificate programs with high quality and accurate information. The MATLAB course offered by Brainmeasures is professionally designed and developed with the help of experts so rest assured that you will be able to understand every bit of detail about the programming language. The MATLAB training which you can get from the course is also highly comprehensive and reliable since it uses updated learning materials that contain accurate details. Before you become a certified MATLAB professional, Brainmeasures will also require you to take up the online MATLAB exam to test the level of your understanding regarding the course. You will receive your MATLAB certificate right after you complete the MATLAB certification program and pass the online exam. The MATLAB certification program which you can now easily access at Brainmeasures is extremely useful for individuals who are still starting to use the MATLAB programming language and wish to understand all the finer and the most essential points of the language’s environment. This is also a huge help for individuals and professionals who work with a team consisting of MATLAB experts and those who are planning to use and apply optimization techniques and the programming language in simulation and modeling, designing experiments and in statistically analyzing data. Your salary as a MATLAB certification holder will be fully dependent on the specific country and location where you have decided to practice your profession, the level of your skills and experience and the financial stability of your employer. Most of the certified MATLAB professionals out there especially those who are holding engineering positions usually earn an annual salary range of around $60,000 to $129,000. MATLAB programmers also enjoy an average annual salary of around $102,000 while MATLAB specialists earn around $69,000 per year. "Brainmeasures has the maximum online courses and the most current ones too. I have pursued a few courses and taken tests from Brainmeasures too and got maximum satisfaction both the times. " Login to view syllabus if you are new Register for an account. Registration is free, No Credit Card details required. panel of subject matter experts is formed who are professionals and have the exact knowledge and experience to write, review and edit test articles. They decide the most relevant and essential topics that need to be examined and tested so that every candidate is equally assessed on a common set of knowledge, skills and aptitudes. The subject matter experts perform brainstorming sessions of various comprehensive topics in which test questions have to be developed in order to collectively select the most significant topics that are appropriate in relation to the test taker’s job and deeply helps to assess the knowledge and performance of the test taker. The questions selected in the test are based on a job analysis and the entire test is developed in such a way that it enables to check the knowledge of the candidate from the job perspective. Tests designed keeping the job perspective in mind leads to more effective screening of the knowledge and expertise of the test taker. After the tests are developed, they are sent for a technical review within our organization. At this stage, our team of experienced and qualified faculty members examine the suitability and correctness of the test and help identify for any discrepancies. Technical reviews are extremely beneficial since they provide a significant number of views and recommendations for improved testing. Brainmeasures strongly relies on in-house testing. The final tests are then sent for in-house testing where the tests are passed on to various candidates who take the test and check it’s usability and accuracy. This helps in providing us with honest feedback’s and suggestions in designing enhanced tests. Once we have acquired the feedback from all the candidates, a collective feedback is given to the subject matter expert’s panel and the important aspects of the feedback are discussed and taken into consideration by them. After receiving the feedbacks, the subject matter experts make the necessary changes for improved and advanced test for the test takers. Once the test has been tested, transformed and improved, it reaches its concluding stage and is finally launched.